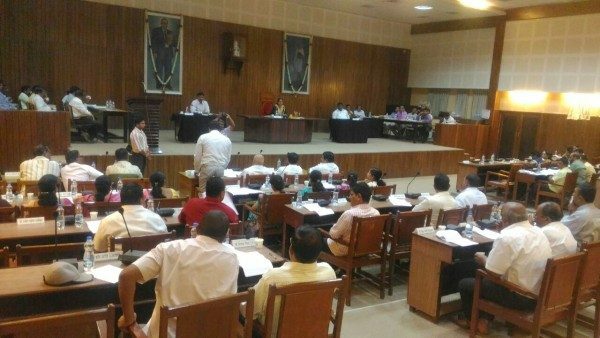 At the general meeting of the Belagavi city corporation today the main point of discussion was the encroachment on Storm water drains. There have been instances in North and South Belagavi where construction has been done on Storm water drains and how is this allowed, asked Ex Mayor Kiran Sayanak. There has been construction going in the Ballari nala and same issue was raised by councillor Birje. Adding to this Kiran Saynak said that a housing complex is coming up at TV centre where in on the CDP there was a storm water drain but with political influence the drain is no missing from the Plan and how is that permission was given for such construction he asked in the house. Complaints have been sent to the CM also about the same but no action has been taken. Councillor Deepak Jamkhandi said that the corporation staff is working in hand gloves with the builders. Replying to the discussion Commissioner Kurer said that no construction can be allowed on a drain of any nature and any size, and no encroachment will be allowed. Why eyes open on encroachment of storm drains only…? most of the buildings in city are being built in a manner contradicting to #CDP.. check out how many building obstructing CDP roads in #NewGandhiNagar… so is the case elsewhere in city… surprisingly these dwellers getting electricity & water contentions (from authorities) with kachha roads (from grants of elected representatives) leading to unauthorized constructions… if this unauthorized construction continues in same pace, with no action from #BCC, then #Belagavi no more can be called #City, forget about prefix #Smart..! Further, until unless government abolish making of #Akram constructions to #Sakram, people will be encouraged to encroach & build unauthorized constructions…! Unless specific complaints in the form of PILs are taken up, no action will be taken by any government body. We will only continue to get such bogus assurances as given by BCC Commissioner on 17th Aug.